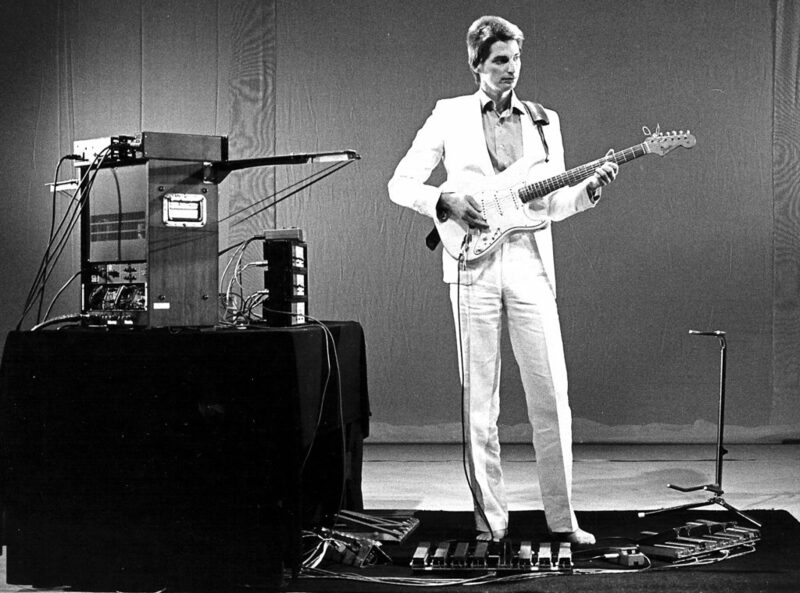 Liquid and Stellar Music – 1981 – for electric guitar and live analog tape loop system. This work began as an idea for a sonic world while working with Terry Riley at Mills College 1973 and when I was working exclusively with the electric guitar. The notion evolved further in 1977 when I produced a 4-track “study” for electric guitar, exploring the range of timbres available for that instrument, while a graduate student working with Robert Erickson at UC San Diego. Since the “study” was essentially a tape composition produced in a recording studio, I had no means of performing the work live as a soloist. Thus in 1979 I collaborated with electronic designer Paul Tydelski in building a performer-controlled live tape processing system (described below) which would allow me to perform such works as a soloist live and without using any pre-recorded tapes. 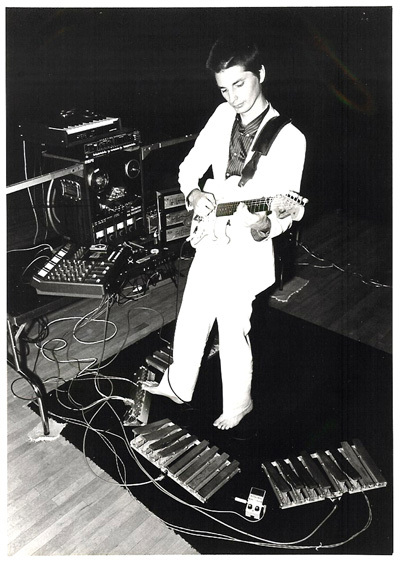 Liquid and Stellar Music was first performed at the Festival d’Automne in Paris in the fall of 1979 and for the next two years it was a constantly evolving performance format generally consisting of a predetermined overall form and germinal composed materials which were developed in a somewhat improvisational fashion while interacting with the tape loop system. In 1981, in preparation for a performance at the New Music America ’81 Festival in San Francisco, the work attained its final form as it appears on this recording. The tape system consists of a four-channel tape machine with three playback heads located at various points in the path of a closed loop of variable speed (different compositions for the system will have different speeds and thus loop durations.) Record/play functions and the mixing and routing of all sounds are controlled by the performer with an array of foot pedals and switches. When composing for the tape system, the materials are chosen in part on the basis of their effectiveness in the context of the processing system. Through the use of this system, it is possible for the performer to build up complex textural, harmonic or rhythmic structures through what is essentially a process of live multi-track recording (and playback, erasing and mixing). There are no pre-recorded materials used in a performance. Here is something I wrote up about 12 years ago describing the history and evolution of my relationship to looping for both composition and live performance. I wrote this before I started working entirely with software on a laptop, which is what I loop on now, either using Mobius or a propriety program that Alex Stahl created in Max MSP. Part way into the piece there is a complete description of the technology of my live tape loop system on which I created and performed Liquid & Stellar Music and quite a few other pieces, both for guitar and other instruments or voices. I first encountered live and studio tape looping in 1973 at Mills College, where I was hanging around and studying with Terry Riley. Craig Hazen, an official graduate composition student of Terry’s at Mills, introduced me to Terry’s typical system: two Revox A-77 reel-to-reel tape recorders placed some distance apart , with one recording and one playing back and with a mixer controlling the feedback level between the playback and the record machine. I used such a system in my very first composition, the 1973, “Music for Two Glass Instruments and Synthesizer.” Terry Riley once told me the La Monte Young introduced him to this system and somewhere else I heard that it was actually Stockhausen who first utilized such a system in the studio. I don’t know the facts for certain about this but I am confident that calling such a system “Frippertronics” is certainly putting the credit in the wrong place, except for crediting its popularization to the rock and roll as opposed to the contemporary classical music communities. After 1973, I frequently worked with the above type system in the studio for purely tape compositions, or jamming, often putting graphic or parametric equalizers or comb filters into the feedback loop and creating gradually transforming textures. But I was constantly frustrated by both the complexity and sensitivity of setting up such a system for live performance and the difficulty of doing rhythmically synchronized music (what is now called minimalist or post-minimalist music). I thus started to think about ways to build a dedicated system that would be reliable, easy to set up and would allow one to do layered rhythmic music, which was my strongest interest at this time in 1977-79. I managed to interest electronic music technician and engineer Paul Tydelski in this project and in the summer of 1979 at UC San Diego, we built the system that was to become my primary performance tool for a number of years. This original live looping instrument was an elaborate analog tape loop system with a closed loop (typically about 15 feet long) which allowed live multi-track recording, mixing, processing and immediate playback of any sounds produced by the performer(s). It consisted of a 4 channel tape machine (a Tascam 40-4) with 3 playback heads (the original record/play head, 2nd normal playback head and a 3rd added playback head located exactly 1/2 of the length through the loop, thus allowing rhythmically continuous looped to be performed lived located at various points in the path of a single loop. While a wide variety of tape loop lengths were physically possible, due to a pair of variable length arms that controlled the tape path, for practical performance reasons, we eventually retrofit the machine with a variable-speed motor and a box with trim pots and switches that allowed many different preset speeds. Record/play functions and the mixing and routing of all sounds are controlled by the performer with an array of foot pedals and switches, thus leaving the performer’s hands free to play their instrument without interruption. This system was my principal performing tool for most of the 1980’s and was integral to many compositions I performed live as a soloist on electric guitar, such as Dark Blue Circumstance (New Albion CD 053) and Liquid and Stellar Music or Destiny, a duo with drummer Gene Reffkin (both on Lovely Music LCD 2011). The system was also used live for the music theater works The Way of How (1981) and are are (1983) both collaborations with the George Coates Performance Works and for Slow Fire (1985-88, released on MinMax CD 010), a collaboration with writer/performer Rinde Eckert and director Richard E.T. White. This work was performed regularly through 1996 using this original system and was recently remounted for a 20th anniversary tour using the new system described below. This system was also used a great deal as a compositional sketch-pad and as sampling became more and more an important part of my work, I often generated large structures on my loops (primarily in an improvisatory fashion) and then recorded and sampled these loops. The samples were then further manipulated within a sequencing and signal processing environment. This last method was used as the basis for the 1990 collaboration Opposites Attract (New World Records 80411-2) with composer and multi-woodwind performer Ned Rothenberg. By the mid-1990’s, the analog tape machine, after hundreds of thousands of miles of touring, became more and more of a headache to maintain and I felt I needed a newer system that was both more reliable and more flexible in terms of loop manipulation in live performance. Thus in 1997 I started working with the Echoplex Digital Pro and eventually purchased three units, with which I continue to work extensively today and to upgrade when upgrades become available (and they do, thank goodness). The first work I performed on this system was a solo work “Retrodisrespective” (1997) which was performed on a Zeta MIDI guitar, playing both regular guitar parts and, triggered via MIDI, an elaborately constructed sampled gamelan. This new system allowed me to both do the repertory created on the old analog tape loop system, such as Dark Blue Circumstance and Slow Fire, and to create new works, such as In The Nameless, a duo with electronic percussionist Joel Davel (on New Albion CD 125) , and the music theater work Sound Stage, both of which involve the use of a large-scale invented instrument called the Quadrachord. I also use this system extensively in improvisational contexts, such as with woodwind performer Ned Rothenberg, percussionist Joel Davel and composer/instrument inventor Mark Applebaum. In this system, I use each Echoplex as a separate monophonic track. A Mackie 1202 feeds whatever input I am using (guitar, Quadrachord, keyboard etc) to all three EDPs and then each unit is controlled with the dedicated Echoplex Foot Controller for all the standard EDP controls of record/play, overdub, multiply, mute, replace, undo, next loop etc. I also use a Digitech PMC-10 foot controller to control the output and the feedback amount (via MIDI continuous control) of both individual and different combinations of EDPs. I also have various signal processing devices that are either before (such as a programmable graphic equalizer, or a guitar processor) or after (such as an Eventide H3500) the EDP input. These units are all controlled by the PMC-10 foot controller. Depending upon the composition or improvisation, these three units can all run in sync (via the“brother sync” mode) or completely independently. I have filled out the units with the maximum of memory however, I rarely if ever run out of memory. Because looping is more than anything else, a repetitive medium, the works I compose or perform on my loopers are largely in a post-minimalist (or as I prefer to call it “pre-maximalist”) style. In a composed work, like Dark Blue Circumstance, I move through recording a series of entirely or largely determined tracks, with some small-scale improvised parts often interspersed during the building process. In a music theater composition like Slow Fire, everything is entirely composed and played live into the system as an accompaniment to the voices, which are also sometime recorded live and looped. After a complete set of looped tracks is recorded, there may be an instrumental or vocal “solo” over the looped tracks or the whole composite of the looped tracks might be run through a signal processor (such as a pitch shifter), allowing the whole structure to be manipulated harmonically or texturally in a more complex way than looping alone permits. Because all music contains repetition and most popular, traditional and non-western musics contain a great deal of repetition, I believe that looping as a technique for both performance and composition will be utilized for far into the future. However, I believe that the actual looping hardware and software that people use will be forever in development. I know that many people are now looping entirely in a software environment and I suspect that that will be the eventual future of looping for most sophisticated approaches to looping (though there will probably always be looping stomp-boxes as well). Within the last year I have tried a number of software-based loopers but to date I have found none to be completely reliable or designed in the way I require for my own compositional process and performance requirements. However, I suspect that within two years, I will doing some of my work with a software system. Of course, I still loop intensely in almost all my live performances as a duo or soloist. Here’s a link to a current work I perform – Glimpsed From Afar – with live looping (originally on Echoplex Digital Pro but now on Mobius) with my Invented Instrument Duo with Joel Davel.